Like any travel blogger, I love exploring recommended places. While I was in Split in Croatia, a fellow traveler asked me to go island hopping. With little online research, I found that Split is just the perfect place to explore the islands of Central Dalmatia, especially Brač and Hvar. The incredible beauty of the beaches and unparalleled, unexplored bays, are worth your time. I recently took at Split to Hvar day trip in a unique catamaran, and here’s what my itinerary and experience felt like. Please note that you can opt for a half-day cruising trip to any of these islands, but mine was a full-day tour. We started at about 9 am from Split port towards island Šolta. We had a swim spot an hour later, and it was one of the best isolated bays I had seen here in Croatia. As we continued towards Hvar island, the beauty of the ocean only amplified beyond words. At about 12.30, we reached Hvar island, where we had an inland tour with free time to check the town. We cruised towards Pakleni islands after lunch, and said back towards Brač Island at around 4 pm. The final swim spot was around Brac, after which we took an hour-long cruise to Split. I wanted to enjoy the trip without being bother about arranging my own food, so had to pick an all-inclusive trip. The catamaran had the choice of soft drinks, wine and beer on board, but note that drinks on such trips are usually limited for obvious reasons. The food was great too, and I really loved the chicken salad they served onboard. In the evening, fresh fruits and cakes were served too. There was also free Wi-Fi on board, and while we were returning back, the open bar and music made for a good scene at sunset. While we had three swim stops, I was particularly in love with the ones at Šolta and Brač. 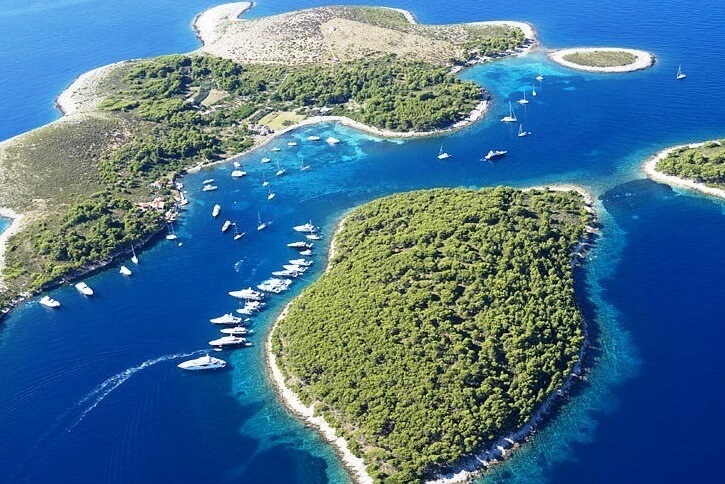 If you are new to Central Dalmatia, Hvar and Brač are good points to start. It only makes sense that you check all the relevant details in advance, and if you are with the family, book your trip in advance. August and July are two busy months, so these day trips may cost a tad more, but I didn’t mind paying more for that experience. Croatia at its very best! Why Should You Go River Cruising in Europe?